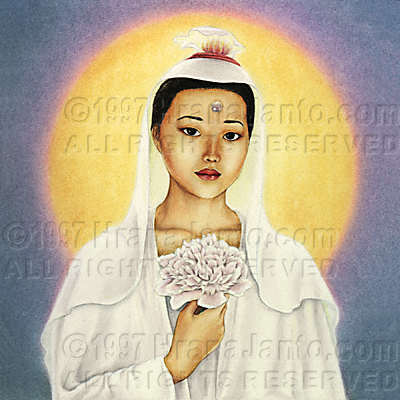 I painted Kuan Yin in 1996 for The Goddess Oracle. She also appeared in Llewellyn's 2001 Goddess Calendar, and was on the cover of Sagewoman magazine. Just as Catholic Christianity has provided an antidote to pure theological patriarchy by encouraging the reverence of the Virgin Mary, so Chinese Buddhism evolved a feminine bodhisattva, or Buddha-to-be, named Kuan Yin. And just as Mary captured the hearts of Catholic worshipers, so Kuan Yin far outstripped the male bodhisattvas in popularity. Both in Japan (as Kwannon, who is often pictured as male) and in pre-revolutionary China, this semidivine being was honored in virtually every home; she was the most powerful being in the entire Chinese pantheon. It was said that Kuan Yin was so concerned for humanity that, upon receiving enlightenment, she chose to retain human form rather than transcend it as pure energy. And so she would stay until every single living creature attained enlightenment. Her name translates "she who hears the weeping world"; Kuan Yin sat on her paradise island P'u T'o Shan answering every prayer addressed to her. The mere utterance of her name in prayer was said to assure salvation from physical and spiritual harm. Even better was the observance of Kuan Yin's own testimony of peace and mercy; her most devout worshipers ate no flesh and lived entirely without doing violence to other beings. Sometimes it was said that Kuan Yin originally lived on earth as Miao Shan, a young woman of unearthly virtue. Although her father wished her to marry, Miao Shan decided to visit a monastery, which, contrary to her expectations, was a hotbed of vice. Her father, hearing of her presence in the convent and suspecting the worst, burned it to the ground. A rainbow carried her to heaven, where her innocent death earned her transmutation into the divine world. On the other hand, it was sometimes said that the bodhisattva emerged directly from the light of Amitabha Buddha's eye. As this story is also told of the male Indian bodhisattva Avalokita, some scholars believe that Kuan Yin represents a merger of that compassionate figure with the Tibetan star-goddess Tara. Yin's name. That continual inner reminder of Kuan Yin's peace and generosity brought such qualities into every aspect of her worshiper's life.